Against the odds, a Chester County mother, her husband and their baby all share the same birthday. 1 in 365 – the odds of parents sharing the same birthday. 1 in 12,000 – the odds of being struck by lightning. 1 in 133,000 – the odds of both parents and child sharing the same birthday. 1 in ? – the odds of both parents and their child sharing the same birthday AND all being born at the same hospital where parents shared the same nursery. Like most married couples, Lauren and Dave Peirce share their life together. The pair started dating at the age of 20 and got married on Oct. 14, 2016. But one could say their paths crossed much earlier – at Chester County Hospital, where they shared the same nursery. The Peirce family doesn’t have to worry about forgetting birthdays. Lauren and Dave Peirce were both born on Feb. 6, 1989 at Chester County Hospital. And now their newborn son also shares the special date. Readers might remember the Peirce family from early October when David Akers of the Philadelphia Eagles helped with their gender reveal at XFINITY Live! Dave Peirce is a longtime David Akers fan and has lots of signed memorabilia collected over the years. 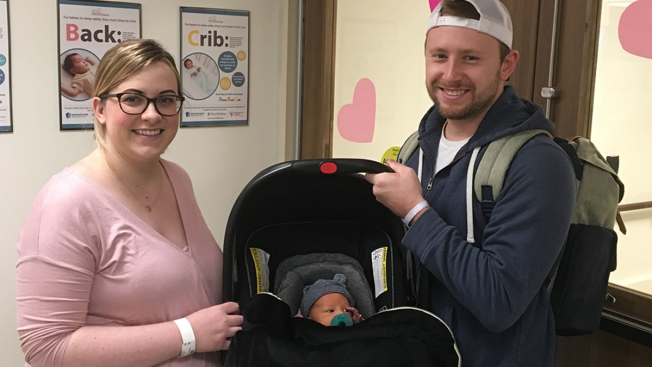 The family's baby boy was originally due to be born on Feb. 18. However, due to medical concerns regarding the mother’s health and the baby’s position, an emergency C-section took place. Just to add another to the tally, Dad and son share another thing; their name. Both dad Dave and now son share the same name. No, they aren't named after their favorite kicker, but were named in honor of Dave's grandfather. Baby David is the third to carry the name. "Our little man was the best birthday present ever, and we're happy to surrender the day to him when it comes to celebrating future birthdays," Dave Peirce said.